Family vacation ideas and destinations are what our Buffalo River National Park BLOG is all about. We archive news about events and attractions our guests love on their Arkansas vacations. our guests enjoy DAY-TRIPS to area happenings year round. Relaxing Massage: NOW you can have a relaxing massage, deep tissue massages, or therapeutic massages when you stay in any of our cabins. Permalink -- click for full blog post "Relaxing Massage Right in Your Own Cozy Log Cabin - Better Than Any Day Spa"
Springfield News-Leader staff recently named a float trip down the Buffalo River as their favorite summer outdoor activity. Other favorite rivers, lakes and parks in the region include Roaring River State Park, as well as the Current River east of Springfield Missouri and Table Rock Lake near the AR/MO border. Dogwood Canyon,south of Branson MO, made the list of favorites - along with Lake of the Ozarks. But the Buffalo National River is their Number 1 GREAT Vacation Getaway Destination, especially for outdoor photography. We have to agree! You just can't beat canoeing or rafting down the Bufflo for taking great nature photographs. Off Highway Vehicles (OHVs) are allowed on designated trails and routes within the Ozark National Forest, the St. Francis National Forest and the Ouachita National Forest. Currently there are ONLY four trail systems specifically designed to accomodate OHVs and ATVs in the Ozark Forrest. Roads within the Ozark National Forest closed by earthen mounds, gates, signs, or other reasonable barriers are CLOSED to four wheeling traffic. According to state law, OHVs are generally NOT allowed on county or state roads. For information on 4-wheeling within the National Forest boundaries, visit http://www.aokforests.com/ and check out the official Off-Highway Vehicle Fact Sheet. Our guests don't ever have to worry about finding a place to ride atv trails or enjoy their OHVs. Anyone staying at our cabins can 4 wheel all they want to on our PRIVATE trails and roads. Permalink -- click for full blog post "Kid Friendly ATV Trail Riding in Private Paradise"
Buffalo National River is becoming one of the most popular National Parks in America. On August 2, 2010 ABCNews featured this area on its Weekend Window program. We agree, Buffalo River is a great vacation spot to visit in the USA. You can view the buffalo river video here. Our rental cabins are just South of Grinders Ferry canoe launch - a great place to swim, fish, or start your own float trip. LOTS OF ACTIVITIES AND FUN FOR ALL !! The Buffalo River Elk Festival is sponsored by the Jasper/Newton County Chamber of Commerce with assistance from the Arkansas Game & Fish Commission and the Rocky Mountain Elk Foundation. KENDA DRIVE IN Movie Theatre, just down the road from our vacation cabins, offers Summer Fun for families and groups of friends. Movies under the stars are one of the best old-fashioned family vacation ideas. It's just hard to find Drive-Ins any more. We're lucky to have one just up the road. 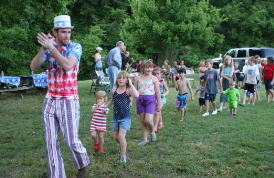 Celebrate 50th Anniversary of Silver Dollar City Theme Park at National KIDS FEST this summer. A Magic Show, an amazing performance of tricks by Stunt Dogs, and a Birthday Cake Eating Contest are just some of the highlights sure to entertain children of all ages. Silver Dollar City and Branson, MO are just a pleasant scenic drive from our vacation cabins and make a great day trip for grandparents and family groups, especially during National Kids Fest. Silver Dollar City attracts folks from all over America looking for kid-friendly family vacation ideas. National Park Service (NPS) is proposing a Facilities Improvement project to upgrade access to the river at Rush and Hasty Landings, provide parking at Spring Creek Trailhead, and improve the Lost Valley Trail. Work on an Environmental Assessment for this project includes taking public input regarding any posssible significant impacts to the natural or human environment.